I decided to write regularly but again got stuck. Now, I am breaking my hiatus from blogging with something I and especially Idhaya enjoyed a lot. 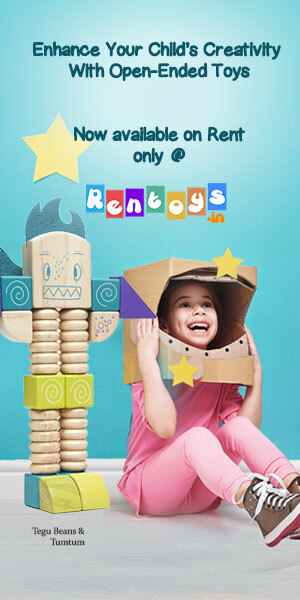 It’s a toys and books renting service that delivers all over India- Rentoys. As much as I like to buy new toys and books for Idhaya, I can’t always do it. The main reasons are the cost and the clutter at home. Add to this the fact that like every kid, Idhaya gets bored of things very fast so many times an expensive toy seems like a waste of money. Toy Box- The rent for ‘Big Box’ starts from INR 1499/- and for ‘Small Box’, it starts from INR 849/-. The big box carries 4-5 toys of your choice worth INR 10,000 and the small one has 1-3 toys worth INR 5,000. Book Box- It costs INR 749 per month and carries 5 books of your choice. All you have to do is subscribe, pick age appropriate stuff and add it to your wish list. Once you subscribe, they pick available toys from your wish-list, add it to your box and send you an email for confirming the same. If you want a change, they make it and ship the box to you. There is no security deposit if you are paying through credit card and very nominal deposit if you choose any other payment method. The ordering process is simple and easy. They even connect you with a Customer Relationship Manager who keeps you updated via WhatsApp. My box was delivered promptly and the toys were shrink-wrapped and packed in a sturdy plastic box. I got 3 toys and all of them were clean and in very good condition. The toys I ordered were- Hape Walk-A-Long Snail, Fisher Price Feelings Monster, Hape Double Bubble. The company suggests giving 1 toy per week to the baby but I gave 3 in 3 days itself as Idhaya gets bored easily. The toys I chose are being loved by Idhaya and she plays with them daily. She’s learning to sort the shapes which is making me elated. Each toy is cleaned and sanitized before sending to the next customer. If you have more than one kid, you can choose a mix of toys and books for different age groups. Rentoys Toys and Books Subscription Service has a special section for Montessori toys too so you can pick something specific as well. If your little one isn’t done with the toys, you can keep them for more than a month by paying the rent for the next one. To sum it up, I have become a fan of Rentoys and will keep ordering new toys for Idhaya. If you also want to save time and space, head to Rentoys now. Don’t forget to use my discount code TRMM while checking out to get 15% off on any box. Have you tried a toy renting service? How was your experience?